Hi I'm Jenn! I'm a wife and mom of three rambunctious superhero and reptile-loving little boys. I couldn't be more thrilled than to be able to laugh, play, and learn alongside the mamas and babies at the Nest. For me, this "job" is truly a gift, an absolute dream come true. I've worked with children, families, and in education for years. I've taught in preschool through 5th grade classrooms, have my undergraduate degree in Psychology with a minor in Child Development, my master's degree in Education, and my National Board Certification in Early Childhood Education. I have developed curriculum for grades TK-5 and conducted professional development sessions for teachers at both the school and district level. I've written about kids, families, and learning for a number of publications and have privately worked with families, consulting on parenting challenges with behavior, sleep, feeding and more. However, raising my three young boys has taught me more about children and parenting than any course I've taken, book I've read, or professional experience I've had. So when you walk into one of my classes at the Nest, I hope I'll have some new insights for you about how kids grow and learn. I hope I can teach you some of the tricks I've learned in working with families, students, and my own children. I hope I can give you the information that you need to make your job as a mom a little easier and a little more fun. But most importantly, by far, I'm a mom right alongside you. I believe that we are all working really hard and are doing our very best. So I want our classes to be the ultimate "mommy playdate": sitting together, chatting, laughing, and being a support for one another. Although our awesome guest speakers and I will provide you with some new information and parenting tricks, above all I'm going to encourage you to find and follow your instincts, your gut, and to always follow your heart. Because I believe that a mama's instinct is her most powerful parenting tool. Hi, I’m Jess. I’m a local wife and mama to a sweet Ed Sheeran & JT loving 8 month old who loves to dance and wave to everyone she meets. I have absolutely loved the start of my motherhood journey and feel so fortunate to have found the Nest, Jenn and the wonderful mamas I’ve shared classes with. Working with children has always been a passion of mine, and I have been unbelievably fortunate to work with children and families in a variety of settings prior to welcoming my daughter last year. I have worked within children’s hospitals, as a preschool teacher, and as a nanny for multiple-children families from infancy through school age. I have an undergraduate degree in Child Development and a master’s degree in Child Life, and am a certified Child Life Specialist. I feel blessed to have been entrusted with people’s children in the best of moments and in some of the hardest. I hope that through our time together, you feel supported and know you are never alone in this adventure. I hope that we can all provide one another with additional information and personal experiences leaving us feeling even more empowered as mothers. I look forward to meeting you and your little ones – whether it be in class, at the park, or waiting in line at Peet’s for a strong latte. Hi, I’m Mary. I am momma to two princess-loving little girls and a very smiley baby boy. I am excited to be a part of this amazing team at the Nest and thrilled to be able to make connections with amazing moms every week! 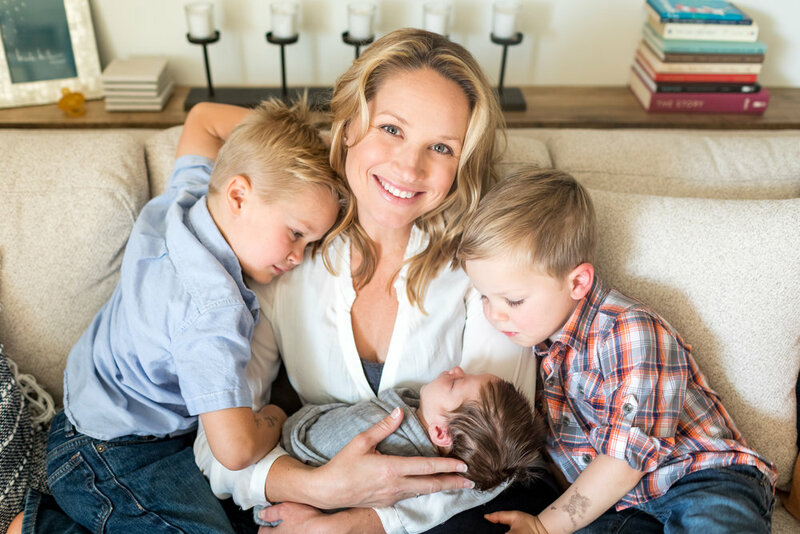 Being a mom has been my life’s greatest joy, and I’m thrilled to be able to support fellow mommies who are also experiencing this incredible journey. Growing up I always knew two things were for sure: I wanted to be a momma and a teacher when I “grew up.” I feel blessed that both of those dreams have come true. I have a bachelor’s degree in early childhood education specializing in the development of children birth through age 8. I have taught preschool, and was an elementary school teacher for over a decade. As an elementary teacher, I had the joy of teaching Kindergarten, fourth grade, and served as a coach for teachers in my role as a reading specialist. Even after that teaching experience, being a mom has taught me more than I ever could possibly learn in the classroom. The experience of being a teacher, combined with being able to be at home with my three children, has been the most incredible learning journey that is a true joy to share with fellow mommies! In our time together at the Nest I hope we can learn, laugh, and cry together, but most importantly build each other up to be confident and empowered mothers! This journey of motherhood is a wild one and I feel blessed to be going through it with all of you! I look forward to getting to know you and your little ones. Hi I'm Mary Beth, I'm a wife and a mom to a tutu wearing, airplane loving toddler. I'm so excited to join the Nest and be able to connect with other moms and babies as we all navigate our ways through this crazy life that is motherhood! But more importantly, I've lived the experience of figuring out how to become a "working mom." Shortly after my daughter was born I returned to work as an SVP in Business Strategy at a Fortune 500 company. And if that wasn't enough, a few months later, I also launched a side business - Live. Work. Lead. to support new working moms! I understand the GUILT, the juggle of child care and last minute work projects. I've felt my career priorities shift and I've definitely had moments where I felt like I was failing at it from all sides... at work, as a new mom, as a partner. But I've also found the joy in pursuing my professional goals while also growing into my most important role as a momma! As a working mom's class at the Nest, you'll get the same Nest experience, with new insights, the tips, and tricks we've learned from our own children and from other families here at the Nest, and the information that you need to make life as a mom a bit easier. In addition, we'll also focus on how becoming a mom impacts your professional goals and how to navigate between the two! I'll share tips and strategies on child care decisions, asking your boss for more flexibility, pumping at work, etc! But above all, these classes are an opportunity for you to connect with other working moms, laugh, cry, have fun, play with your babies and ultimately support each other!